Jinsoku with his newer sealed Zanpakutou (yet to be mentioned). Done by Louhi <3 till infinity. Birthday: Unknown. When his Mentor found him, September 7th was declared his birthday. Persona: Jinsoku used to be usually quiet, apathetic, and emotionless. However, once reaching the Shinigami Academy and joining the Gotei 13, he has learned to become respectful of others, kind, loyal, and mostly friendly. Jin speaks his mind now, but has a certain tact. More or less, turned a complete 180 as compared to his earlier life. The more people he encounters, the more he finds out about himself, and seeps out of the shells and masks that he once wore. Recently, he has learned to fight not for himself, not just for strength, but to help others and defend them. His loyalty to the other members of the Gotei is unwavering. He sees everyone in the Gotei on equal terms, with the exception of Soutaichou Shinkou Masaru. He firmly believes that he is nothing more than but a weapon for his Commander Captain. Everyone else, no matter their disposition, is considered Jin's equal. Jinsoku's view of equality among others gives rise to his lack of formality. He is not necessarily rude; rather, he doesn't like attaching titles to others (save Masaru and a few others) unless he finds it extremely necessary. Since he sees everyone as his fellow man, his disposition is very warm, natural, and open. He likes to crack jokes whenever possible. A clueless man at times, Jinsoku gets easily confused at things that require heavy thought. He finds himself looking at the world with childlike wonder. Although he doesn't realize it, his mannerisms are often acted out like those of a child. He giggles, romps, does things seemingly out of character at times. Which makes himself look very odd, given his appearance. At one time, Jin's only drive was to continue fighting until his demise, for that was all he had ever known. Every encounter used to be met with reckless abandon. His personality reverses from the goofy drunk into the stern warrior. However, with each member of the Gotei that he meets, his opinions on battle change (although he loves the rush of the fight no matter what). Jin's appearance belies his true nature; at one glance people would mistake him for a common punk or lowlife. But they only play into his assumptions of the shallowness of others. Though it will always be a part of the human condition, he hopes to teach others that covers don't matter on books. Ever since he purchased his sake decanter, he has become more and more a lush with each passing day. Never is he seen without that beloved bottle of his; never does he go without completing the bottle in a day either. With that said, he has become more and more lazier. He still trains, but never in his rigorous schedule that he used to follow before. Becoming a Captain has dulled his work ethic; by handling the burden of too much work, he now feels the need to take everything else lackadaisical. Favorite Food: Ice Cream, Cookies, Pretzels, Beef Jerky, Sushi, CANDY!, Ramen, Plum Sake (got to have your fruits), Beer (liquid bread! ), Mimi Keiki, Pansit (with a twist of lemon), Sinigang, Adobo, PIE!... there's so many, and much more. Likes: Food. Training/ sparring/ the lust of the fight. Michi. ラブラブ (Rabu Rabu) Sake Decanter. Women (his constant nosebleeds will state otherwise). Getting inebriated. Napping. The innocence and SPRINGTIME of youth. Dislikes: Arrogance. Titles. Overcomplications. Dealing with Kidou. Build similar to Bruce Lee- thin, but with a well-toned musculature. Dark skin with random scars criss-cross his body, ranging in size and shape. One particular scar runs diagonally over his lips. Dark silver hair, with black streaks that is head length. His spiky hair leans to the side on the top, and has bangs strewn across his face; it's similar to a "bed head" look. Has two different colored eyes, very similar to a Husky; one eye is sky blue, whereas the other is emerald green. Above the blue eye, he wears a hoop eyebrow ring. He dons a spiked collar with a broken chain link still attached to it. His gi's sleeves are torn off, and he wears two spiked bands around the middle of his biceps. He dons arm cloth from the bicep down, and then wraps his forearms and hands in cloth. For no apparent reason, wears a belt between his chest and stomach. Wears two huge cuffs around his wrists. Spoiler: Piccu Galery cause Jin be so hot! Jin and Louhi... by Louhi O: looks frikkin divine. Rough sketch of Jin in his Captain's "uniform"
Jin with his fur-lined hooded Haori up. once again, drawn by the lurvely ihi. Spoiler: Here's Miharu's UBERTASTIC colouring of Jin x Yuri !!! Spoiler: Jin in Shi Kai, with Michi and such. Drawn by awesome Ximena, Jin in Shi Kai, with Michi, Zotto Goggles, Rabu Rabu Sake Decanter, and Kanshoku's Teddy Bear. Zanpakutou: Nanashi ("Without Name/ Seven Deaths"). A simple Zanpakutou, that looks like a kodachi. Has no handguard, a red-cloth wrapped handle, and a single spike on the end of both handle and hilt. There is also excessive red cloth that hangs from it. Hangs on his lower back, off a studded belt and chain. Lightweight, and held backwards, used for defense, while Jinsoku attacks with his hand-hand skills. Zanpakutou Shi Kai: See below. Biography: Jinsoku died at the early age of four, and grew up in the slums of 80 North Rukongai. With no one to help him, he relied on his speed and stealth to survive. However, he was eventually caught in a clever trap. Otherwise, he could outrun any living person in that district. The boy was forced to serve under a ruthless gambler, known as Hiromasa. Since he was so fast and agile, Hiromasa named his new slave Jinsoku, or Swift. Jinsoku would continue stealing, only this time under his master. Whenever mistakes were made, Jinsoku would pay dearly, being beaten to near death. This is how Jinsoku's personality has developed: into an obedient dog. A retired old Shinigami caught wind of "the fastest person in Rukongai 80" , and saved Jinsoku from his cruel captors. Sensing the incredible spirit pressure within the child, the Shinigami, Mamoru, agreed to train the child. For countless years, Jinsoku was pushed to his limit. His specialty was in hand to hand combat and movement. Jinsoku's personality changed very little. Mamoru gave Jinsoku the chance to become a Shinigami, and hoped that he would accept, and become a better person. In a first meeting with a Hollow, Jinsoku saved a dog, and rushed in blindly, thinking he could defeat it with his bare fists alone. Getting crushed by the Hollow, Mamoru stepped in to save him, along with the dog. When Jinsoku healed, he decided to keep the dog, and named her Michi. Michi appears to be a hybrid of wolf and Doberman. Mamoru recommended Jinsoku to the Academy afterwards. A tormentor of his sparring partners, this is one of the reasons Jinsoku came upon Cross, a fellow student of the Academy. The second reason is the fact that he liked to keep stealing (secretly a klepto), but would return possessions to his victims at a later time. He stole from Cross (and vice-versa) and she also became his new sparring partner. Through a rough first altercation, the two became friends. Cross forced Jinsoku to open himself up a little more. Eventually, another student at the Academy, Tian-Cai, found the two still playing their games of thievery and caught them. Forcefully becoming their friend, his genius enabled them to devise better schemes, along with some silly pranks. Jinsoku and Cross were accepted into the ranks of the Fifth Division of the Gotei 13 a year before graduation, due to 1st Commander Shinkou Masaru. Tian-Cai graduated as well, but was transferred to the newly reinstated Keigun. Persona: Michi has more of a personality similar to a dog, if one can say that. She seems to act like a human on many levels though. She treats Jinsoku not as an owner, but more as her best friend. This in turn creates an even deeper bond between the two. She is willing to go to great lengths for her friend; many a times she has saved him in the face of danger. Although her appearance can be frightening to a stranger, Michi sincerely has a soul of gold. This hound takes great joy in meeting everyone they come across, there is hardly a time when she ever feels apprehensive. A fan of showing her appreciation and joy with a wet tongue, Michi licks nearly everyone she sees. Without disregard for her abnormally large size, she has been known to pounce upon people as if she were a pup. She genuinely cares for most people she comes in contact with. Ridiculously intelligent, Michi seems to have a full grasp upon the human language. She can understand nearly everything people say, and has enough logic and analytical skills to react to any said or given situation with reason. Aggressively, Michi is a force to be reckoned with. Her true nature of wolf comes out; the innate instinct of a survivor, hunter, and fighter kicks in. Since she has a great bond with Jin, she seems to read his movements and coordinate attacks with him accordingly. Michi will stand up for and protect anyone she deems worthy of saving; unfortunately, this means nearly everyone with an honest and deeply benevolent soul. Physical Appearance: With the appearance of a wolf, Michi can be quite clearly be mistaken for one. However, no one has performed a DNA testing, or any scientific tests of that matter on her (she simply won't allow it). Around three and a half feet tall give or take several inches, she is colossal. Very shy, much like a woman about her weight, she refuses to be weighed. Michi has wild, thick, long trusses of raven fur. Within this raven fur are markings of silver, misty gray, and white. It does not look like she is aging; rather, these highlights further accentuate a more noble look upon her. Above her eyebrows are these markings; along the tip of her tail, and the 'boots' of her legs. In the right light, underneath the matted fur, she has markings on the side and on her back; but almost always, one can only see her onyx coat. Deep amber eyes, orbs which seem to be of molten gold, penetrate those who lock gaze with her. Perhaps this gold reflects the shining quality she has within her soul. Switching from either a warm and shimmering affect, inversely, they can be piercing portals that cut into anything they see. Michi wears no collar because of her relationship with Jin. However, she has taken a shining to imitate her best friend, and wears spiked cuffs around each of her 'ankles'. She's hardly ever seen without them, cherishing her bond between Jin even further. Underneath one of these 'anklets' is a bracelet Sophia Spora had given Jinsoku when he was a child as a token of their friendship; in turn, Jin gave it to his new best friend. Bio: Not much is known about Michi, other than the fact that she stumbled upon Jinsoku when he had fought a Hollow in Rukongai. She helped save him and ever since then, she has never left his side (only on occasions when she wants to separate herself from the lug and get some private time). Other than that, if she could talk, she would more than likely give you a story. Or more simply, Jinsoku can just ask, "Can you see the riddles?" Form Change: Nanashi explodes in a dazzling array of light, whose fragments repiece themselves onto Jinosku's cuffs on his wrists. On his left arm, a chain attaches to the cuff, which is in turn connected to a three-pointed star. The star can be used like a chakram in melee combat, or can be thrown at a maximum distance of 150 feet. The chain automatically returns once it has been used. On Jinsoku's right arm, is a blade on the side of the cuff. It is the length of a kodachi, but with a greater width. Normally it points backwards, but can be switched to point forwards for greater offensive use. The spirit of Nanashi is unconfirmed, hence the activation phrase. To Jinsoku, Nanashi has appeared as a floating mist, with no corporeal form. Nanashi's voice is just as ambiguous, only berating Jinsoku when necessary. Recently, in a trip with Setsujoku to the bowels of Hell and Tartarus, Jinsoku realized his Zanpakutou manifestation is Cerberus, the three-headed hound that guards the gates of Hell. More than just a mere form change, Nanashi has bestowed certain abilities to not just the Zanpakutou, but Jinsoku's dog, Michi. Lending upon the Reiatsu of both Jinsoku and Nanashi, Michi leaps within a sphere of their physically formed Reiatsu. This sphere is the color of both white and blue, like the core of flame. However, this sphere of Reiatsu is not hot, but the contrary, it is cold like ice. Once Michi is enveloped with this sphere with Jinsoku and Nanashi, the earth loosens beneath her, floating above her, then condenses into a layer around her. It's mixed with a combination of Michi's, Jinsoku's, and Nanashi's Reiatsu, with a thick layer of earth- an armor as dense as a Zanpakutou's. Also, Michi gains half of Jinsoku's stats under this ability. With Jinsoku's increase in Connection and strength, Michi's does as well. As profound as the name is, it's merely a mental control of Nanashi's star and chain in its form change. The bond between Jinsoku and Nanashi is heightened, as he becomes able to telekinetically bend the star and chain of Nanashi to his will, detaching the two pieces from his left cuff. Similar to the frigid Reiatsu that Jinsoku emits, it manifests itself into a blue fire and steam, which covers his weapons, or any desired body part of Jin. This fire burns, but not in a heating sense. Since the fire is so cold, it burns like dry ice. Thus it is capable of completely destroying cells if it comes into contact. It freezes on contact and burns like so. Jinsoku is also able to shoot projectiles of Hellfire from his palms. Hell isn't as hot as one thinks. The bond between Jinsoku and Nanashi is truly connected in Ban Kai. Revealing its true power, Nanashi bestows itself to Jinsoku and Michi both physically and spiritually. Since the manifestation of Nanashi is the three headed Hell hound that once guarded the gates of Tartarus, Cerberus, the Zanapkutou undergoes a drastic synergy between both Jinsoku and Michi. Once Nanshi has entered Jinsoku's skin, a colossal column of Hellfire engulfing him reaches to the heavens, a bright blue flame with a white core. Its frigid presence converts the moisture in the air around it to turn into either snow or ice, causing a mini blizzard to form around it. The same process is done with Michi, if she happens to not be by Jin's side. Once the pillar of fire dies down (which is almost instantaneous), there are two new transformations. But to understand the reasoning behind the transformations, knowledge of Nanashi's form must be acquired. Since Nanashi is Cerberus, its form in Shi Kai is embodied by the physical appearance of three heads. The chain, star, and blade each represent the head of Nanashi. Now, the spirit and single head of Nanashi flow into Jinsoku and merge. Jin gains a thin, yet durable armor (a body suit more or less), and leather like in both appearance in feel. It is tainted with a black that seems to encompass all that is dark. Chains are wrapped about the costume, and may be used as melee weapons, but Jin has seen no need for it yet. The outfit comes adorned with small, half-inch spikes jutting out in various places. Over this armor, he wears a tattered cloak which hangs down to his feet; the insides of the veil are red, as opposed to the pitch black cape itself. The physical body of Nanashi synergizes with Michi, forming an elephant sized, living, breathing, Cerberus. Michi's head retains its corporeal form in the middle of the triple heads. The other two heads of Michi appear to be more hound like, as opposed to appearing like a wolf. The behemoth's skin seems to be smooth, onyx in appearance, but upon closer inspection, it is more like russet like scales. Down its back are boned spikes, but each piece quite small to notice and far apart from another. Michi's tail is as long as its body; adorned at its end are three blades, giving it the appearance of the star of Nanashi. Jinsoku gains two abilities once he has undergone this transformation. He is able to pull the blade of Nanashi anywhere from his body, and keep it held within the skin. Thus, any single physical based attack is easily susceptible to the blade coming out of anywhere in his body and intercepting the strike. The second ability of his is the ability to summon five columns maximum of Hellfire at any single given time. These pillars raze from the ground and are roughly the size of Michi in her Cerberus form; but twice her size. Azure flames, they burn with absolute frigidity. Since it is near the same temperature, if not colder than liquid oxygen [Liquid oxygen has a boiling point of -297.3 °F (-183.0 °C)], it is able to burn, freeze, and destroy cells unlike its opposite of fire (which completely incinerates whatever it comes across). Not all of the pillars of Hellfire have to come out at once, Jin can summon two if he desires while keeping the other three in reserve. He is also able to combine the strength of each column, say for instance, he can combine three pillars into one massive one, adding its width and destructive effect, while willing two other columns to erupt at two separate places. If necessary, they form a defense against energy based attacks, because he is using his own Reiatsu to summon these pillars and fortifying them with his strength. In the extension from Ban Kai, Michi synergizes herself into Jinsoku. He has now become a true Cerberus inside, having absorbed all the strengths of both his Zanpakutou and friend. Form: Coating Jinsoku's entire form is a jet black viscous substance. More or less appearing to be a shadow, it is truly durable as a Zanpakutou, yet can bend its shape at will, thus able to stave off any physical attack, or lessen its brunt force. Ability: Starting off, this amorphous armor can simply form Jinsoku's weapons in Shi Kai simultaneously, along with other crude shapes that don't require complex thought and concentration. However, with each rise in connection, and raise in strength in Shinno Ban Kai, Jinsoku will be able to mentally create more and more detailed forms and such. Its extension of how far it can reach becomes longer and longer as well. Eventually, at 100% mastery of Shinno usage or so, he should be able to manifest himself into the form of the Cerberus in its Ban Kai state, if he so desired. The armor itself has a finite amount, which is its only weakness. Once Jinsoku uses a portion to throw, for example, in Nanashi's star form, it lessens the total amount of armor on Jin. However, once the star returns back to the armor, it is able to grow back. The black armor that he utilizes is given its respective elemental properties; meaning, his body can be coated entirely in the cold Hellfire, as well as any extension his armor creates. Similar to the appearance of a cracked earth volcano, blue rivets of flame crackle and blaze throughout the suit normally. Attack: Useable several times in a fight due to its explosive attack power, Jinsoku is able to manifest both Michi and Nanashi physically into perspective. Bursting forth from the ground, the triple heads of Cerberus erupt outwards in a volcanic explosion of Hellfire. These three heads basically lash out with swings of their teeth simultaneously. For example, one head may hold onto the opponent, while the other two bite and tear the rest of their victim to shreds. A Hakuda technique devised for Shinigami without Zanpakutou, to defend themselves and halt the opponent's Reiatsu-based attacks for a short while. Empty Palm focuses a great deal of Spiritual Pressure internally within any body part, preferably the hand. Such a high concentration of Reiatsu, along with knowledge of its flow, enables the user to create a shield of pure energy. Its size is approximately 1 and a half feet in length, with double the width of the chosen body part used in Empty Palm. If Empty Palm connects, the user's limb cannot be properly used for two turns. This feat must also be used within 2 turns, or else the excessive storage of Reiatsu within dissipates back into the said area, thus numbing the limb for 5 turns. Able to defend against physical attacks up to 3 times the user's Reaitsu, but not any higher. Once successful, it halts the opponent's Reiatsu for 2 turns. For the same amount of turns in which the opponent's Spiritual pressure was disrupted, after the disruption effect expires, the opponent experiences a recoil period where Reaitsu consumption is 50% higher than normal. Basically, 2 turns of the opponent has no SP use, where the next 2 turns drains Spritual Pressure by a greater amount. Empty Palm disrupts the internal organs of whatever it hits, able to cause extreme damage/ rupturing/ hemorrhaging, yet cause no external damage, and is also capable of numbing the struck extremity. However, it does NOT do these things if connecting with a Zanpakutou. But if opponent's hand/ body part is within Empty Palm's radius, then effects apply. Able to block energy-based kidou attacks as well, up to 1.5 times the user's SP. With enough ability of Reiatsu, Hohou, and Hakuda (and Kidou), the user is able to create quick yet powerful bursts of Reiatsu/Kidou/shunpo to move more fluidly in battle, dodge more strikes, and string together techniques easier in a rapid blitz succession. Movement is severely increased; by using a burst of Reiatsu/Kidou/shunpo, the user is able to abruptly stop on a dime, increase normal movement and velocity, and thus able to counter incoming attacks more readily. Think of the technique Baizou Tobiagari combined with a shyunpo. More or less this is the effect; so essentially, the user is able to fight in midair if desired by continually using bursts of energy to supplant a base. Or an imperfect or limited distance one-few step Kanshunpo. This feat requires short bursts in a small movement radius. 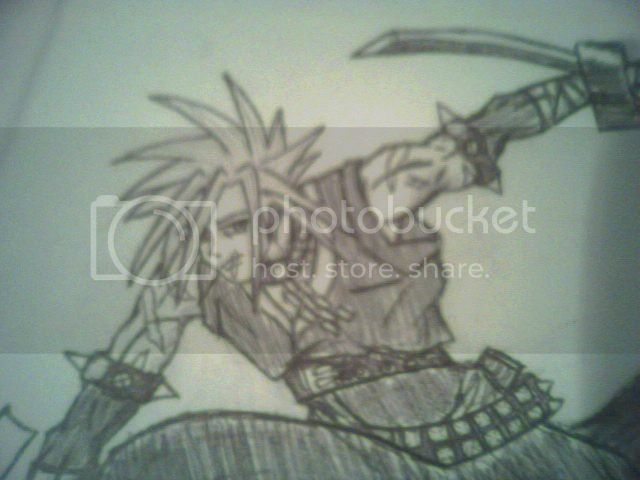 Visually to the opponent whenever Jinsoku uses these bursts, he will begin to flicker in short distances, throwing off the perception of his attackers. This feat enables Jin to string together a maximum of 3 Hakuda techniques in swift near split-second action, and able to dodge attacks much more easily. As an added effect, due to also utilizing Kidouryoku in his shunpo, Jinsoku's very shunpo speed increases by 15% as opposed to flash stepping normally. [ Ryuu Nashi ni Ryuu ] "Style Not Having Style"
Jinsoku has mastered many techniques of the arts of hand to hand combat. He is seen to some as an inadvertent genius of the Shinigami fighting path of Hakuda, having birthed several techniques of the path on his own accord, while learning others with incredible deftness. The ability to pick up on so many techniques without much effort enables him a unique feat. He fights with no set style in particular, yet is able to utilize a multitude of Shinigami techs concerning Hakuda. Also, the cost on any Hakuda technique is lowered by 15%. There are drawbacks to this, however. Due to having no true style, he is thus unable to equip any type of Bujutsu whatsoever. None. The other requirement to this is that more than half of his technique library must be occupied with Hakuda techniques, or those involving the use of Hakuda. Allies that have faced many hardships together often gain a higher bond. Through such a connection, comrades are able to face the brunt of duress and adversity with a heightened degree of tolerance. Touitsu Kousen, a sister Technique to Touitsu Sensen, culminates this aspect of bonds into an inherent defensive mechanism. This Tech allows characters that have reached a special bond to endure and tolerate more damage than usual. Characters under Touitsu Kousen's effect receive a -15% physical and spiritual damage reduction, and a +15% effectiveness increase to all defensive Kidou, Techs/Feats, and Zanpaku abilities. Touitsu Kousen remains wholly invisible in a "non-duel" circumstance. Otherwise, it automatically occupies a Tech Allocation slot (though still does not count towards the Tech List). Note that this only takes into account the base, listed cost of the Kidou spell. Kidou cost reductions from any other effect/skill cannot be taken into account and be used as "shortcuts." A hand-to-hand Technique that is executed as any direct attack. Using the Technique creates an echo of the user's strike following instantly after the initial attack with great speed, often leaving the opponent bewildered if he is not cautious. It's most useful when doing heavy attacks, as it will force the attack to strike twice. When performing this Technique, the second attack--the echo--will only do half the damage the initial strike would. Doing this Technique will seem like watching a film glitch. You see the initial strike, and then suddenly an exact replica follows. The sister Technique to Goubouseisetsu, conceived specifically for those that favor empty-handed measures of battle, and for situations in which one finds oneself disarmed while combating Hollow opposition. Houshou is activated by clapping and holding one's hands flat upon one another, as if in prayer. Reiryoku from both arms will stream through and collect at the closed space between the user's hands, manifesting in a turquoise light that seeps outwards brilliantly. After releasing the hands from each other, two light-inscribed characters can be discerned, one upon each palm: "反" and "虚," or "han" and "ko," meaning "anti-Hollow." While the two characters are shining, the user may utilize the enchantment to great effect in two ways. Striking a Hollow or Hollow-type enemy with a palm attack will generate a jarring, concussive impact that works to fracture or destroy its hardened defenses (bone, metal, carapace, etc. ), and to forcefully push back the opposition by several feet, if not meters. Flesh or muscle that have been struck this way will bruise profusely and numb over, causing lowered reaction time and movement in the affected limbs/regions that lasts for four rounds. Houshou gets its name primarily from this type of attack: with each successful palm strike, a booming cacophony is born, like the sound of a newly fired cannon. The other use of Houshou is in direct, non-impacting contact with a Hollow enemy, which causes the touched Hollow matter to ignite into a violent reaction of teal fires and sparks. This is purely from a reaction between the light-inscribed characters and Hollow matter: Houshou will fiercely degenerate it into wasted matter and energy that cannot be used for regeneration. Of course, for the Hollow opponent, this becomes exponentially more painful the longer the contact is maintained. However, this type of execution is less effective against hardened defenses, so it is recommended for use against direct skin or flesh, and it usually necessitates at least a second of full contact before the results of the attack can become apparent. Houshou is activation-based, just like Goubouseisetsu. The cost itself is variable, where the user may input as much as he or she desires. More input Reiatsu will equate to higher effectiveness and magnitude. By default, the Technique grants two uses, one for each palm. However, spending increments of 300 Reiatsu will grant one more use for each palm, and will increase the effectiveness of the Technique in increments of +10%. The maximum damage for the palm strike is the same as that of a Zangeki, only calculating Hakuda instead of Zanjutsu. But just the same as Goubouseisetsu, Houshou will deal double the normal damage against Hollows and Hollow-type enemies, but the effects of the Technique itself will not manifest against others. Once 10,000 Connection or 4,000 Hakuda and Hohou are reached (whichever comes first), Houshou can be extended to enchant any Hakuda-type blasts that are fired directly from the palm (but not fists, chops, etc.). This Technique was founded upon the basic principles of Iaidou (unique art of sword drawing and cutting), but is instead performed with the fist and any sort of adequately taut covering (i.e. pocket, obi sash, tightened sleeve, etc.). In turn, the resistance created from the covering will increase the push from the strike, enabling a faster attack. The result is a "bullet" of sheer air pressure. It strikes at an increased velocity-- faster than a normal punch from the user. However the strike's speed is weakened in raw power due to no tangible Reiatsu/Kidou empowering the blow (1/10th attack power of Hakuda stat). Its maximum range is six meters, with one usage gained for every 500 points into Hakuda that the user has. The other added ability to this attack is the fact that the user's arm moves faster than their opponent's eyes can see. Unless the antagonist has at least 50% of the practioner's Hakuda stat, viewing the arm in motion alone is considered impossible. However, those with more than half the user's, they will be able to see the speeding fist. The strength in this technique lies within its faster than normal, invisible attacks. More or less consider this a mix between the two techniques Hankyou and Kireme no Kobushi. Though unlike the former, it doesn't require an initial strike. And with the latter, the fact that it doesn't require Kidou/Reiatsu strengthening the technique enables the user to mix in different Hakuda/Kidou skills and spells to further accentuate and heighten the power of Iai-Ken (meaning both Hankyou and Kireme no Kadouga could be used in conjunction with this technique). A Hakuda specialist must be able to deal with many types of situations. Against airborne enemies, a simple uppercut or jump kick may be able to handle the situation. But a more thorough Technique was devised to better deal with natural enemies in the sky. This Technique requires the user to store a certain amount of Reiatsu within his/her legs (2% total). The jump expels a certain amount of Reiatsu (1%), which enables the user to quickly soar into the sky (at 125% his/her Hohou). Once the person reaches his/her desired height, he/she swing outwards with one leg, releasing the Reiatsu outwards explosively. The result is a crescent shaped arch of energy, which equates to roughly the user's height, with a width of the user itself. This crescent, or 'guillotine', which the Technique was named after, becomes as sharp as a Zanpakutou and is able to combat against physical attacks up to 1.5x its strength. The duration in which the crescent stays is no more than a second, but that leaves the user open to creating the latter half of the Technique. With that said, the user quickly spins in midair, and releases another guillotine of Reiatsu afterwards. It is the same as the first, and was created to damage/ finish off the opponent (the first kick is mostly used as a counter). Note, however, that the user may not extend into the second kick if he/she deems it necessary. With that totaled, the amount of Reiatsu expended is now 3% (1% for the jump, 2% for the crescents). Those who further master the Technique are granted with the ability to physically launch the guillotines of Reiatsu and hurtle them like projectiles (at the cost of expending more Reiatsu; 1% for the dual crescents). The distance to these guillotines is rather limited though (five feet maximum before dissipating). For one that has ultimately mastered the Technique, he/she need not jump anymore. Rather, he/she is able to effectively kick these guillotines from the ground if need be and launch them like projectiles. The maximum distance is now ten feet. A Technique necessitating the formation of a knifelike position with the hands and using Reiatsu to fortify or harden them, enabling the user to pierce through most surfaces. The damage incurred by Nukite mainly depends on the speed and accuracy of the attack, but it rarely finishes off the enemy. Nukite is mainly used to subdue or weaken a part of an opponent's body. Once this Tech is applied to an opponent, it forces out small amounts of energy to disrupt the flow of power into the struck parts of the body. It basically disrupts the function of that area for a couple of seconds before returning it to normal. Based entirely on the reasoning behind meditation, this Technique is performed solely through the control and focusing of the mind. It is a specialized ability to "trace" Reiatsu. This includes the basic form of being able to sense where people are, but in battle, Atozukeru is used to trace and learn "patterns" in movement (by tracing smaller patterns of energy movement, like the wave of an arm, for example), both within the opponent (e.g., footwork, hand to hand combat) and also for the Zanpakutou (e.g., swordsmanship). It enables the ability to "see" these patterns so openings for attack and opportunities for defense are increased. However, the user's Reiatsu is drained at a rate of 150 per round for the duration of Atozukeru's effect. A Technique combining a mastery over Hakuda, Reiatsu, and Kidouryoku. Dondengaeshi is initiated by forming a twisting spiral of Reiatsu around the user's arms or legs (depending on what part of the body he or she prefers). The energy only lasts for a moment-- five to ten seconds, or one complete turn-- but it blazes so furiously that it actually causes to affected limbs of the user to flare with the color of his or her Reiatsu, though this is simply cosmetic. The user then strikes out at the target, the spiraling force of the blast digging into the part of the zone of impact, while thin streams of Reiatsu spread throughout the struck area. The streams exit out through the user's body and split across the target's limb, leaving black marks across the area hit in the form a deep spiral. The afflicted body part then convulses severely. This is not because of the strike, so much as the Kidouryoku used in conjunction with it. It is a specialized Kidouryoku that works without a set program. The Kidouryoku that is released upon the impact cuts through the skin and deep into the body, going so far as to imprint itself onto the muscles and bones. The bone is then cut by the strike and the muscles are twisted, compacting the area and causing it to crush itself. This attack is extremely painful and can leave a struck area almost useless, and... if struck in certain parts of the body, it can prove to be fatal. As such, it usually is not recommended for use in most casual fights (as with most high level Techniques). The attack itself consumes 6% of one's Reiatsu with each use, and can only be used once for every 5,000 Hakuda that the user has. This Technique is designed to counter Atozukeru, however, it is also useful in its own right. As a counter, it enables the user to "diffuse" their energy patterns, and at higher levels, the user is able to diffuse patterns so much so that they may become untraceable by those with less Reiatsu. As a unique Technique (and a higher level one), Kakusan enables the "throwing" of energy patterns so as to distract or confuse opponents by resting patterns on sound waves (e.g., echoes). When this Technique is mastered, Kakusan can be used to form "clouds" of energy around opponents which dull their sense abilities by 10%. Kakusan's passive diffusion drains Reiatsu at a rate of 150 points per round and/or 120 Reiatsu for every time its active effects are used. Rather than having to rely on bursts, this special form of Shunpo is a continuous flow of Reiatsu that increases the distance that can be traveled ten fold and allows for a smooth transition into Shunpo and out of it consistently in battle. The character is allowed to evade many more attacks, but Reiatsu is drained at a quicker rate. The third and penultimate level of this Technique is by far the deadliest. The original distance of the attack is now tripled (fifteen feet maximum). The strength is still dulled at this apex; however, now at the amount of 75% the user's striking power instead of half as compared to the first two levels. Another dangerous use of this level is the fact that the user may strike with not two, but three consecutive times for the cost of one use. The user MUST expend at least 2% of their Reiatsu to utilize this Technique. The radius of the burst is still five feet, but now, its strength is heightened considerably, up to 125% of the user's normal striking power. Like the previous levels, it loses half of its strength at maximum distance. But if the user prefers the regular kinetic explosion instead, its strength is reduced to 75%, as stated above, yet the burst's radius may be enlarged to six feet. When the user expends 3% of their Reiatsu, the gust of wind may be used as an adverse gale, creating a vortex. It will pull in the opponent in this case; however, the pull will only work on opponents of equal level Reiatsu or less. The radius of the vortex is five feet, and its maximum distance is ten feet. Note that this does NOT place the opponent in stasis; they are fully capable of counterattacking while being pulled in. Once the opponent falls into the effect, they are still struck by the force of the user's limb. The defensive capability of this Technique remains the same against energy based attacks; the amount of Reiatsu poured into the strike depends on when the attack is nullified or not. Once again, perchance the energy attack is any higher than this, it will be slowed down by the air current and its damage decreased by a small fraction. Against physical attacks, however, this Technique may deflect anything rated equal to or lower than the amount of Reiatsu used to fuel the attack. The technique Shunkou has been recorded in the annals of Shinigami history as being one of the most difficult abilities to learn. Rigorous training involved in both the fighting paths of Hakuda and Kidou are required to utilize such a dangerous ability. However, there has been a technique birthed from the basic principles of Shunkou, enabling the user with an attack that is very similar to (yet weaker than) its parent. With enough knowledge of Kidouryoku flow within, the practioner is able to create ranged and concentrated blasts of energy from nearly any part of their body. This eliminates the need to incant spells of the Demon Arts (think Chad's ability). Kyoukou Rakurai is considered to rival an Arrancar's Bala blast, or a Shinigami's Zangeki (given they're on equal standing with the user). The further the knowledge with this ability, the more dangerous this projectile becomes. At first, this blast be used as a haphazard concussive force of Kidouryoku. Through further training, the size, distance traveled, and applications become more versatile. Its initial distance is 5 meters. The size created at first is roughly quadruple the width of the user's arm. The second stage in this technique enables the user to channel the Kidouryoku into a smaller area- thus breaking its application as a projectile, but now being used as an explosive close range attack with the gain of more power. Distance of the projectile is now increased to 7 meters, and size is now octuple the width of the user's arm. The third stage enables the practioner to literally bend the trajectory of their normal blasts, but only by a marginal amount. The furthest the blast can stray is roughly a 15 degree angle break, and can only be initiated at the halfway mark of the blast's distance (5 meters; max distance is now 10). Its width is now increased to become the size of the user itself. By the time the practitioner is just about ready to reach Shunkou, the technique will become mastered. A combination of the physical prowess and speed used to strike one's foe quickly and effectively. This Technique allows the user to use Shunpo and propel a concentrated attack perfectly into a specific part of their opponent's body, causing severe damage to the inflicted area. A large amount of Reiatsu is used, and if the character's Hakuda is not higher than one's target and the Hohou similar, the attack may be easily countered. Otherwise, the Technique has a high chance of success. The Lotus is essentially made up of three sections, the first two doing damage on their own but merely there to set up for the true attack, which is the third section. The aim for this attack is simply to drop down, driving your enemy into the ground at a high speed. The first section is comprised of the user charging up Reiatsu into a striking spot in his/her legs. The initial strike only works if the user is traveling at a high speed, thus the user must charge at their opponent (or circle him/her until the correct speed is accomplished). A single high kick is then delivered to the enemy. The effect of this kick is to both stun your opponent and to drive him/her skywards far enough for the second section to begin. The following two stages all rely on the initial kick's aim to stun the opponent, since if the opponent isn't stunned long enough for the second stages combo to begin, the enemy may escape. Beginning the second stage, the user pushes him/herself upwards from the ground using a burst of Reiatsu to propel his/her body upwards towards his/her supposedly stunned opponent, then a series of high speed kicks is delivered into the opponent. The kicks must be harsh and packed with Reiatsu as each kick needs to propel both the user and the enemy skywards with sheer momentum. About ten to fifteen kicks are delivered within a brief moment, which gives the user the proper height to initiate the final and most devastating part of the Lotus. The final part of the Lotus is the trickiest: upon carrying out the heavy combo of kicks, the user grapples onto his/her opponent in the fashion of a bear hug, angling the opponent's body towards the ground head first. Once the enemy is secured, a two stage burst of the user's Reiatsu is used to both spin the two of them at a high speed while the second is used to forcefully propel the user and the enemy towards the ground in a devastating spinning pile driver. There are three times an opponent can stop the Lotus from finishing each stage having a more difficult rate of failure the further up it goes. Stage One : If the opponent is 2x stronger then the user the initial blow will not stun him/her and thus the opponent may counter before the second part is able to begin. Also, if the opponent's speed/Hakuda is more than 1.5x the user's, then the kick may not even land. Stage Two & Three : If the opponent is two times stronger than the user and the initial strike successfully connects, the opponent may be able to stop the combo and counter or escape. The Lotus has its effects upon the user though. If all three stages are carried out, a grand total of 10% of his/her Reiatsu is consumed (3% for stages One and Two, and 4% for stage three). And after all three have been carried out, another Lotus may not be initiated until after a two-round rest, in which time the user's Hohou will be penalized -10% due to fatigue. A stronger power form of Shikai. Rather than running on Shikai Reiatsu, the user taps into their inert Zanpakutou power and brings out Ban Kai Reiatsu and uses that to run the Shikai state. Due to the immense energy that Ban Kai gives off, the power from the release works to boost two of the user's stats by +15% (except Reiatsu and Connection). This boost can only affect stats that are valued over 6,500. Torrents of Kidou can now be channeled to support the body of the user in unarmed combat. These torrents manifest themselves as explosively charged electric lines of spiritual power that radiate outwards from the user's shoulders and back. While the torrents are in place, the user will experience a +20% boost to both Hakuda and Hohou. In addition, the user is able to channel large amounts of Kidou to release huge blasts of Kidou energy with their strikes. These blasts of energy cost 8% of the user's total Reiatsu value with each use. Also, by learning Shunkou, the user gains access to the defensive Technique, Hanki, with the additional requirement of having to be learned by itself in the form of a written volume dedicated solely to learning the Technique. Shunkou's duration (in rounds) can be calculated by taking the average of Hakuda and Kidou, dividing that value by 1,000, and rounding it to the nearest whole number, with a Reiatsu drain of 2% per passing round. Spoiler: How I understand Asterisks by techs? *: Denotes Tech List-occupiers that do not take up a Tech Allocation slot. **: Denotes a Tech that does not count toward both maximums for the Tech List and Allocation. ***: Denotes a conditional Invisible Tech (each has its own way of working). **: Denotes a Tech that does not count toward both maximums for the Tech List and Allocation, through use of the Feat "Ryuu Nashi ni Ryuu". Techniques that are used mainly for offensive purposes. Attack Techs vary in the way they appear, and may be summed as being one of or a combination of physical, mental, and/or spiritual attacks. Techniques that are used to defend against general or special attacks. Defense Techs may appear markedly in the battlefield in the form of barriers or any type of deflection mechanism, or may appear much more discreetly in the form of subtle or unseen methods of protection. Techniques that work to incapacitate the enemy's fighting ability. Status Techs usually come in the form of stat deductions, bindings, and/or negative status effects, though they may have other influences. These Techniques do not directly deal damage to the target, however. Techniques that afford the user the ability to heal and/or recover from a deprived condition. Healing Techs are used to repair and/or remedy damaged/infected matter through a number of various methods and processes. Techniques that enables the user to move in a special way that cannot be achieved normally. These Techniques often allow the user to move at a much quicker pace. Techniques that are used to boost the capability of the user. Boost Techs are strictly limited to boosting stats, however. Techniques that grant augmentation/protection that cannot be reflected stat-wise. Aura Techs have a wide range of uses and purposes, and often cover Tech types that do not fall in any other category. Techniques that are able to link with or link certain other abilities for higher potential effect. [Aisu] -- The user gathers water spiritons in their hand, aiming then at the target. Once the energy is release, a thick powerful wave of water shoots out. The water freezes as soon as it flies out, forming a powerful Ice spear that can pierce through the enemy on contact. Aisu has a max reach of 50ft. [Aisuhaaken] -- A variation of Aisu, Aisuhaaken works by pelting the target with numerous spears of ice and numbing their bodies. Outside of the change in chant, Aisuhaaken also works by changing the casting motion. Instead of point the hand straight, the fingers are shot out. Because of this, the particles of water shoot out in multiple directions. The drops instantly change from droplets to foot long ice spears. The number of spears is always different, but it is usually about a hundred. The number can be increase however by putting more energy into it, since Aisuhaaken was basically made to take on large groups. [Aisudansu] -- The final and most powerful form of Aisu, Aisudansu works by barraging the target with numerous penetrating icicles. Aisudansu works by releasing a large icicle spear. The spear stops once it breaks the skin of the opponent or when it freezes onto the opponent. The icicle then explodes, numerous icicles exploding from it. The icicles shoot out from the base then all bend back in towards the target, impaling them brutally. Description: The user presses their hands to the ground as they chant this spell. Stone javelins shoot forth from the ground, surrounding the opponent. They all come down on the person, shredding them. Altar begins with 4 javelins; however 2 javelins are added for every additional 200 in the kidou stat. However, after one is able to summon 20 spears by default, they must pay an extra 200 kidou for every 2 spears summoned. Each javelin appears 10 ft from the target, they are all about one yard in length and 4 inches in thickness. Incantation: Screaming earth rushes from the ground. Striking down all those who stand in its way, M0ther nature's fury made real. The frightening power revealed. Hadou #37, Altar! [Kanchou] - The spell's high cost comes from its lack of gesture required to cast. At the end of the chant, a spire of earth shoots diagonally up from behind the opponent, impaling them from behind and down. This spire is infused with the kidou energy, and hax a maximum extending range of 10 feet before the spell's effects stop. The caster can manipulate the length however they wish. Incatation: "Adults cry as the children reap what they deem theirs. Crimson blood to tired reflexes, I summon thy infantilism. Hadou #37, Kancho." Description: Erects a gleaming and crystal clear wall of water some two feet thick in front of the caster, held in shape by a powerful layer of Kidou energy around it. The wall will nullify a single attack valued up to 2x the caster's Reiatsu. Getting hit by an attack causes the water inside the barrier to boil immediately as the energy of the attack is routed through it. A few seconds after the opponent's attack, the front wall of the barrier will vanish and the huge amount of boiling water will be washed over the opponent. The rest of the barrier will disappear soon after. Incantation: "Beast from Air, beast from Water! Wrapped around my finger the noble composition, a perfect alloy! Serve and protect, claim vengance for unjust! Chiyudo #69, Arrosez Miroiter!" [ Arrosez Maison ] - The extension for the Arrosez Miroiter must be cast while the water within the original barrier is boiling, meaning in the few seconds between the attack is absorbed and the water is unleashed. By adding the short extension and expending an additional 1500 Kidou, an additional four water walls are added to form a cube around the opponent. Taking heat directly from Kidou energy, this water is quickly boiled as well, and the entire cube of water collapses onto the opponent within. Incantation: "Lock on, take aim. Blue crush, Arrosez Maison." [ Banshiissei ] (Non/Cnt/Self) - Bougyoudo #30, 1.3 times the Bakudou used. Description: A Bakudou removal spell. The user chants the spell and concentrates. This focuses a greater amount of energy out of the user to push away and nullify a Bakudou spell. Since there are many different types of bakudou, there is no set rate. It takes about 3-10 seconds depending on how much the spell has formed and how powerful it is (the more powerful bakudou taking at least 10 or more seconds to break). So, the effects are not instant and any damage that occurs from the spell itself stays. When the bakudou is released however, a bright flash is released, allowing the user to escape. However, the flash only lasts for a few seconds itself. Incantation: The captured begs for freedom, selling their souls for a chance to escape. The cornered man forcing his last hand. Bougyoudo #30, Banshiissei. Description: A direct Kidou attack, this move must be done at point blank range. The user of this attack focuses Kidou energy into one of their hands, the entire hand soon becoming covered in the energy. The energy is constant, and will stay as long as the person wills it to. This technique gives the hand a great destructive force, allowing it to punch holes in walls and greatly increase that person's striking power - to the point of being able to fracture or break bone. The power of the fist becomes stronger the longer the person keeps the energy concentrated, the energy becoming more taxing to keep it going. The largest cost is in between successful strikes when the energy has to renew itself. In stronger shinigami this technique can even allow them to destroy large structures even without a zanpakutou. Incantation: Forbidden hand formed of the soul, strike with the might of a titan. With this power allow me to obliterate all that stands before me, reducing it to rumble. Raw energy given shape. Hadou #27, Breaking Palm. Description: A higher form of Antidote (Chiyudo #5), Chuuwa neutralizes medium level poison effects. Low and medium level poisons will be cured and neutralized completely, while higher level poisons (depending on the difference in SP between the user and the target) will either be stopped temporary or slowed. Range: Within 2 ft of the target. To cast this, the user guides reiatsu toward the wound by holding their palm toward the wound. Healing reiatsu must enter an open wound to dispel the poison. Incantation: From this body, neutralize any evil that may harm it, banish any pain it may feel and leave it free... Chiyudo #30, Chuuwa. Description: The user charges their kidou energy into their left or right arm. Their arm it then engulfed in flames. The flames don't hurt the user or burn their clothing, but it will do just that to anything else in comes into contact with. The flames last for about 30 seconds before it burns out, but that isn't its primary use. The primary means of attack for this move is to force all those forces from the arm to the hand and release it in one giant burst, large enough to completely engulf the body of an average-sized person. Description: A variation of Cinder. Instead of sending out an attack as one big burst. Blaze sends in out in a flamethrower-like attack, increasing its range and concentration of power. Incantation: None, just change Cinder to Blaze. Description: Another variation of Cinder, Sun Flare works by increasing the power of the burst even furhter. Instead of a red burst, it looks like a small, orange sun(about 5ft in diameter). The sun has fiery flames blazing off up it and gives off extreme amounts of heat, causing great damage when it hits. Description: Daifuku heals muscle fatigue for battles of longer duration. In other words, by forming "oxygen" through a user's reiatsu that replenishes lost energy in a target's muscle tendons, movement is renewed and restored. This therefore enables rejuvenated speed and defense abilities by up to 10%, depending on the SP differences between the user and target. Incantation: "Cool muscles like the sweetness of the evening and the warmth of the sunrise, let this body replenish... Chiyudo #27, Daifuku." Description: A spell used to negate the lingering effects of all non-zanpakutou abilities on oneself; Dispel is considered one of the most powerful Chiyudo there is, especially for its learning cost. By expending a fixed amount of energy, the user is able to negate nasty effects (such as poison or stat reductions) that are left over from kidou and other techniques. Dispel only negates the direct effects something has on the body and returns it to its previous unafflicted condition, as such it cannot negate most bakudou (since they do not effect the body directly, that simply place a binding over it...however, it will negate the lingering effects the some bakudou have). The cost for the spells is as such. *Note: Because of the power of the spell proper experience is needed in negation. Because of this the user much have a kidou equal to or higher than the cost of the spell they're negating, and a kidou stat equal or higher than the maximum perquisite for a technique. *Note: For techniques, the number means the perquisite to learn. The negating cost, however, is the reiatsu cost of the technique. Description: A special kidou formed by the Arcana, other shinigami have been known to have knowledge of this attack however that in itself has been a rare occurrence. Fist of Destruction takes and wraps Kidou energy around the user's hand. The energy then becomes a bright white. The energy can be extended from the fist for 5ft and the damaged minimized, but the true strength comes from direct contact. When FoD strikes at close range the focused energy will gather into the striking point then explode, blowing apart the stricken object and leaving a searing crater. However, the Arcana were said to have refined the ability so much that it actually tears away at the outer flesh of the user, causing the cracked skin to glow brightly. Description: Hyoukai Seppen's focus is on internal wounds and/or damage. The snowflake, a physical manifestation of the caster's SP, enters an open wound and as it melts within the recipient's body, attaches itself to areas of physical internal damage, for example, a laceration to an organ or the disconnect of a vein. Because the process of a foreign SP entering another individual is fairly painful, the snowflake itself serves to numb the point of contact to minimize pain. Healing internal damage, instead of external, serves to increase the overall stamina and well-being of the target once healed. Beginning with a base chiyudo efficacy of 60%, further increases in healing correlates to caster's SP, where every 200 pts of kidou (above the base cost) allows for up to 10% increased efficacy. To conduct this, the caster must place one palm over the other facing--but not touching--an open wound. (If no open wound is apparent, a small incision in the flesh must be made.) The snowflake should form just under the bottom palm and will descend directly into the wound. It will become effective almost immediately. Incantation: "From the night sky, among the clouds of ice, release a single snowflake of timeless beauty...Chiyudo #40, Hyoukai Seppen." Effect: This is a tricky kidou, because unlike others this one utilizes the foot instead of the hands. When the spell is cast, the user stomps the ground, the kidou then shoots through the ground. It travels under the opponent then shoots up like a mini geyser, trapping their legs in ice. It slowly moves upward until their entire body is covered. It takes about 20 seconds for lower half to be covered, and 40 seconds altogether. The ice is about 4 inches thick and infused with kidou energy, making it very strong. People of considerably greater spiritual pressure can break out of it easily, however people of similar strength may find it difficult of people and a little time-consuming and people of considerably weaker strength, impossible. Ice prison's strength is increased in places with lots of water and is decreased in places with little water, taking half the time in former places and almost double in the latter. It also works faster if the opponent is already covered in ice. Can be extended into Ice Maiden. Range: The stream can travel underground for about 30 feet. However, since the opponent cannot see it, the attack is hard to evade. Higher level shinigami can detect the attack though. Phrase: The body runs cold, the sins clear in the liquids cold reflection. Judgment divine. Bakudou #17, Ice Prison! Description: Ice Maiden can only be extended from Ice Prison. When 50 percent or more of the opponent's body is covered in ice. The user clasps his fist, causing the kidou energy within the ice to retract, driving the solid material into the trapped victim. When used by stronger shinigami, this technique can even break bone. Range: Extends from Ice Prison, so it can only be used when opponent is caught in that kidou. Phrase: Destruction of form, destruction of will. Recede and destroy, oh frozen wrath. Bakudou #17, Ice Maiden! Description: Golden chains of dense Kidou burst through the ground and actively pursue and bind an opponent for up to half a minute. Chains can be summoned all at once, or up to five can be stretched out over the span of a minute. Description: All techniques are garnered from the memory. When a technique or kidou is used, one must first recall the technique and then place energy into it. However, the Lunatic Seal has the power to negate all that. The user forms a seal on the palm of their fist and slams it into their opponent. Once activated, the inflicted opponent is restricted from using all non-zanpakutou techniques that involve the use of reiatsu in any way (basically any attack that isn't 100% melee in form) for 15 rounds and all non-zanpakutou techniques that were already in play are stopped and negated. The only technique that can be used through this is the one known as dispel which was specially built for the negation of such spells. The cost of this spell is 1.5-2x the kidou the opponent was using--the range dependent on the caster's level of reiatsu in comparison to the opponent's. To cast this, the user manipulates the reiatsu of their opponent while within the two feet range by holding their palms toward the general center of the opponent's body. Only a faint white glow will indicate the spell is in progress. Incantation: "In love, through hate... in black through white... in day, through night... reverse and mirror the energy of bad intent... Hadou #43, Meikyou." Description: A sacred circle forms around the user. The orb forms 10ft away from the user. It is one foot in width and has an inscribed circle at the north, south, east, and west points of the circle. The circle is a pinkish color and when it activates an upstream of air shoots from it. The circle has a healing effect on all organisms within the circle that the user chooses to use it on. The circle completely heals all minor and moderate wounds and can slightly recover all major wounds. During the entire time that the user and all those inside the circle are save from all impure substance. The circle lasts for 20 seconds before it disappears. Description: While there exists such techniques as the 'Mirror' Hadou, and the 'Hanki' technique, sometimes one wishes to cancel an attack and not reflect it, but cannot use Shunkou. So, this spell exists for those of the quick wit and faster mouth. However, this spell must be used and finished while the other is still chating or gathering energy, so its practicality against quick, weak Hadou spells is very limited. However, the greater Hadou spells are much more easily targeted with this (especially with Incantation Bypass). Incantation: "End time, the seventh plane quakes. To the east, your sun rebels and does not rise. Nothing shall ever stand the test of time, and so I perish your will! Bougyoudo #51, Persecuted Dam"
Description: Used on broken bones and severed ligaments, Marrow works by creating a many small threads of energy that repair and heal the damaged area. With this spell minor fractures and injuries can be repaired in a matter of seconds and more serious injuries can be healed in a few seconds. However, during the healing process, if the user does not go easy on the injured limb, the threading can become loose. But that is only under extreme stress. Description: After the chant, kidou energy is rerouted into a constant stream into the body instead of casting spells one at a time, this keeps one from casting kidou while this is active but provides a very important benefit. The energy is released from the body in short bursts during points of impact. It allows unarmed fighters to block and be blocked by weapons without injuring them. It requires the user to know the strike is about to happen however, so if someone gets past the user's defense, they will still be injured. Incantation: My body is my weapon, my soul, Iron! Bougyoudo #47, Sude! Description: An extension to the spell 'Sude', Ran costs an extra 150 kidou per strike to come into effect. The user summons even more kidou energy during an attack, forcing the energy to course wildly and surge to levels that it was not meant to rise to. The result is that the energy coursing through the body becomes somewhat unstable, causing the energy to not remain as a simple burst when coming in contact with something. Upon contact, the energy normally used to simply allow the limb to survive an attack from a weapon, changes to a concussion type of focused blast that, when attacking, makes the the opponent feel as if they are getting hit with the full on force of a sledge hammer in addition to the normal damage the strike would cause. Incantation: None, just needs to be used while Sude is active. Description: Kidou users are sometimes forced into psychical confrontations, and while some are able to handle themselves in said fights, others may not be. As such a spell that allows one to boost their physical attributes was needed. Spirit Armor works back having the shinigami force their spiritual energy into a form of translucent armor over their bodies. The armor not only serves as a damage dampener but it works to increase one's fighting power too. The layer of the armor is no more than a few centimeters itself and it is extremely light-weight and flexible as not to hinder movement. When activated, the user burns a set amount of kidou energy of their choosing. Then that amount of energy is refined from kidou energy to that of reisatsu. That total is then added into the user's maximum SP total, increasing their power by that amount. This not only increases the user's attack power but the armor also dampens damage from physical attacks. There are limits, however. No more than 25% of one's kidou can be converted and if one wants the full protective effects of the armor they must at least burn out 1000 kidou points. Incantation: "My soul becomes my shield, hardened to the point of steel. Unbreakable is my resolve, untainted is my faith. Bougyoudo #73, Spirit Armor"
Description: A dark cloud forms above the user of this technique, and a bolt of lightning strikes. This does not harm the user away, however, both their arms start to crackle with an electric energy. The user of this technique can either use this for combat for shoot the attack in a blast. In combat, the thunder acts much like a gauntlet, adding power to the users attack. However, the user can also smash both hands against the ground. When this happens, a large electrical field will shoot out for about 20ft, injuring anyone who is caught within it. The gauntlets however will start to weaken and disappear after two minutes. The thunder blast shoots out like a wild current, with a giant spherical ball of lightning flying out at the target while it crackles savagely. The bolt of lightning can travel at incredible speeds, what's that are hard to catch with the normal human eye. The blast will then barrel down on the target with a fierce power, much like a giant hammer. Description: Deadens the body making the user incabable of feeling pain for a limited amount of time. The user ignores cuts, bruises, and broken bones that they have. The side effect is that it is very possible to bleed to death, since while the kidou is in effect you feel like you're in perfect health. So it becomes near impossible to tell the extent of your injuries. Unfortunately, when the kidou wears off prepare yourself since with servere injuries you'll probably be overwhelmed with pain. Incantion: Kill the senses, deadened this body! Restrain any pain that could be inflicted! Bougyoudo #30, Threshold! Description: Almost instantly heals all major wounds. But due to the nature of the magic/energy, is very painful to use. Can also kill someone who is too weakened to deal with the shock, so caution is recommended in its use. Description: A unique Bougyoudou spell that allows for the flexible creation of weapons. Once cast, the user will create an ethereal frame either in his/her hand, in the air, or on the ground. The frame itself takes after the outline of the desired weapon that the user wishes to create. Once the frame is fully visualized, Reishi from the surrounding environment will rapidly collect and compact to physically form the weapon itself, much like water pouring into a receptacle. Incantation: "A waterfall from heaven descends to wash away the castle of a thousand spears. Let the staining blood swirl in the clouds; dreams will never see so great a sea of swords! Bougyodou #31, Souseiki no Yaiba!" Element - Elemental Properties. Basically this is the elemental affiliation of a spell. In case of multiple affiliations, the spell will either have two or it will only have the element that is most favored. [Fir] - Fire. Primary source of flame and heat based damage. It used for any kidou favoring said element. Mainly used in Hadou and Bakudou. Favored element of aggressive kidou users. Attacks of this sort tend to be focused on causing a great amount of damage to one person. Bakudou of this nature tends to be based around not only binding the opponent but causing heavy burns to hinder movement. [Wat] - Water. Primary source of all things water. It used for any kidou favoring said element. Mainly used in Hadou and Bakudou, but present in some Chiyudo. Favored element of Chiyudo users. Attacks of this type tend to be based around drowning or simply bombarding target with large amounts of water. Chiyudo of this nature is based mainly about cleaning the body of infections and impurities. [Ice] - Ice. Primary source of all things Ice. Is used for any kidou favoring said element. Mainly used in Hadou and Bakudou. Favored element of aggressive attackers and chiyudo users. Ice kidou tends to be about to heavy damage to one or more target and temporary freezing their movements. While chiyudo of the type is usally for preventing blood lose or preserving limbs. [Wnd] - Wind. Primary source of all things involving wind and air. Mainly used in Hadou, but can be featured in Bakudou, Bougyoudo, and Chiyudo. Balanced element, favored by aggressive kidou users and passive ones. Has many practical uses for all arts. [Ear] - Earth. Primary source of all things concerning the ground and earth. Mainly used in Hadou, but can be featured in others as well. Favored by aggressive kidou users. Hadou of this nature tends to be about taking down a large group of people and temporary disorienting them. [Wood] - Wood. Primary source of all things concerning plantlife. Used in multiple arts. Has many practical uses. [Met] - Metal. Primary source of all things concerning Iron and other metals. Used in multiple arts. Has many practical uses. [Ltg] - Lightning. Primary source of all things related with lightning and the heavens. Mainly used in Hadou. Favored by aggressive kidou users. Lightning based attacks usally revolve around causing great damage to one target and temporary paralyzing their movements. [Dark] - Dark. Intangible element, Dark is more of a state of being than a element. Most dark attacks are based around draining the strength of a target, causing a infliction upon them, or killing them in a malicious way. Mostly used in Hadou. Favored by aggressive kidou users for it's ability to weaken opponent. [Lgt] - Light. Like Dark, Light is intangible. Mainly used for kidou that focus on healing and purifying the body of both wounds and malicious presences, and destructive arts that are based around purging dark spirits. Balanced type, but extremely rare. [Non] - Non-Elemental. An ability that has no specific place in the elements. Usually seen in Bougyoudo. Favored by mainly and has many uses. Type - Basically, this is what the kidou basically is or what it does. [For] - Force. An intangible form of kidou, basically used to describe when kidou is used in a way that is unseen. Has many different types. [Brt] - Burst. A term for a large force of kidou that is released in a short amount of time. Such as a desperation attack or a close-range attack. [Beam] - Beam. A term for focused kidou that is released steady and in one direction, such as a laser beam. Used mainly for Hadou. [Sht] - Shot. A term for a focused kidou that is released all at once but in one direction, like a bullet. [Str] - Strike. A term for kidou that involves physical striking. [Bst] - Boost. A term for kidou that is used to augment an ability or stat. Mainly used in Bougyudou. [Ill] - Illusion. A term for kidou that is used to trick the opponent or create illusions. [Hea] - Healing. A term for kidou that is used mainly to heal and/or purify one of wounds and other malicious properties. [Wave] - Wave. A term for kidou that is released like a wave, usually causing massive destruction and hard to evade. Also term used for skinnier waves, such as energy blades. [Grd] - Ground. A term for kidou that effects the earth or comes from the ground. [Bar] - Barrier. A term for kidou that causes barriers and shields. [Phy] - Physical. A term for kidou that causes a physical augmention on the user or target. [Men] - Mental. A term for kidou that causes a mental augmention on the user or target. [Mov] - Movement. A term for a kidou that is mainly used for moving user or target. [Com] - Communication. A kidou that allows the user to communicate with one or more persons, or to communticate with something they normally wouldn't. [Dim] - Dimensional. Term for kidou that affects the dimensions of Soul Society, Earth, Hell, and Huero Muero in any way. [Bind] - Binding. Used mainly in bakudou, it is a term for any kidou that keeps something stored for binds something for any long period of time. [Hom] - Homing. A kidou that homes in on the target and usually will not stop until it has been fully evaded or has hit its target. [Exp] -- Explosion. A kidou that when released explodes violently. [Con] -- Constant. A kidou that stays active as long as the user wills it. [Sky] -- Sky. A kidou that strikes from the skies, usually raining down on the opponent. [Area] -- Area. A kidou that is meant to affect only a specific area. [Mat] -- Materialization. A kidou that forms an item or thing. [Te-op] - Team Optional. A kidou that can be performed alone or with multiple persons. Range - Basically the area of influence for a Kidou. [Srt] - Short. Kidou only reaches a few feet and is usally accomplished by direct contact with the user and target. [Mid] -- Mid. Kidou that have a decent range, but one that far enough to be considered long. [Lng] - Long. Kidou can reach far reaches, allowing the user to hit their target without being in the line of fire themselves. [Wide] - Wide. A term for a kidou that has a large, but undefined, area effect. Usually seen in high levels. [Tar] - Target. A term for kidou that only works in a fixed area, usually one decided by the user. [Dome] - Dome. A term for a kidou with a Dome like area of effect. One that can or cannot be based around the user or target as the center. [Frt] - Frontal. Barrier Only. Term for a barrier that only appears at the front of the target. [Side] - Side. Barrier Only. Term for a barrier that only appears at the side of the target. [Rear] - Rear. Barrier Only. Term for a barrier that only appears at the rear of the target. [Self] - Self. Term for kidou that is only meant to affect the user. A gift given to him by the ex-Captain of the Third, Kanshoku Meisekimu. However, this was all before their promotions and such, when they were both seated officers in different Divisions. A nice, cute, brown teddy, she threw it to Jin before he fought Tenshirou in a Sou Kyoukou Tournament. The amazing fact of the matter was, this same teddy had prevented Jin from receiving a critical wound against Tenshirou. Bloodied and punctured still, it hides gleefully in Jinsoku's robes, its beads of coal eyes shining. Jin honestly cherishes this gift to him and brings it wherever he goes. More or less a lucky keepsake. Purchased at an autumn festival, Jinsoku bought one of these for both Yuri and himself, at the sake stand where they had met for the second time in their afterlives. Unintentionally, Jin was forced to purchase this specific decanter with "ラブラブ" scripted upon it. Although flattering and somewhat pretentious on Jinsoku's part, he did not harbor feelings of 'love love' for Yuri at the moment. Rather, he purchased it so that they could enjoy their time together around the festival. He carries this decanter with him everyday; to remind him of one of the best nights he ever had with one of the most honest women he had ever met. Tied by a sash, it hangs off of his useless leaning belt around his waist. Each time he drinks from it, he swears, it gets sweeter. His most cherished keepsake that never leaves his side. A pair of lovely, sporting, dashing goggles provided by the tinkers and laborers down at Eighth Division- Arcane Science and Technologies. An almost seemingly normal pair of goggles, they have the inherent ability to track Reiatsu of Hollow presences. Well, they track massive Reiatsu presences to be more specific, as Jinsoku, Junichi, and Ichigawa found out on their Hollow patrol. Also, the goggles enable great night vision. Since that night reminded Jin of one of his last meetings with his 'aibou' (partner, buddy, pal) Ichigawa, he still carries it either on his forehead, or tucked within his robes. Gladius is the Zanpakutou of Aurelius Drex, the rogue Shinigami Jinsoku was assigned to terminate for his Taishyuu field exam. A normal katana, there is no real practical use to carrying someone else's Zanpakutou; it might as well be an Asauchi for Jin. Purely ornamental, he keeps it as a memento of his fallen ex-comrade in the Gotei. A reminder of himself to never betray his Soutaichou. Spoiler: Sample Chapter for Application into RPG! The wind howled, throwing wild torrents of air. Amongst this force, leaves flew, dancing to the scream of wind and spinning in motion. "Where is he?!?" Quickly scanning his head from side to side, while slowly pivoting his body amongst all directions, Jinsoku was on guard. "How do I find him, if this ****ing wind distracts every sense but the eyes?" Mamoru, his old mentor, had taught the basic necessity of the senses. Even then, night had already fallen. The little light that was available became torn into fragments amongst the forest. "What?!?" A booming ominous voice echoed throughout the woods. "Can you not find me?" "S***!" Even the direction of the sound was unknown. The wind continued its cry, adding more frustration to Jinsoku. Something faint blew under his nose. The odor! It reeked of pure death and malice. "There!" Before he had realized, the target was straight ahead of him. The spiritual pressure grew slightly denser with each passing step. Thunder struck, crashing amidst the sky, while illuminating the dark presence of the forest for a short second. "I see him." Jinsoku thought. Had the wind been not so erratic, Jinsoku would choose a path downwind, and out his victim's sight. He paused, muscles tensing. Jinsoku had been deceived once already by his foe, but only because he jumped into battle brashly. He smiled, for Mamoru was correct. Battles are not won only by fists or strength. They are won with intelligence as well. "Hell, this is no fun. Opportunity waits for no one!" Jinsoku ran, as fast as he could, towards the looming shape. It grew bigger with every step, its silhouette covering more of the area around him. His thrashing footsteps could not be masked by the constant shriek of wind. The rattling of the chain on his collar was noticed. The spiritual pressure was at its thickest now. Jinsoku arched his arm back while dashing for a chance to attack. The shadow turned, instantly stretching a limb out to strike. Jinsoku sidestepped to his left, and struck the dark body part with the side of his right fist. Continuing his motion, he sprung forward, retaliating with his other fist. Jinsoku yelled, "Got-"
His hand stopped. Jinsoku's body quickly lifted from the ground and was thrown into a tree several yards away. His back ached from the impact. "His speed increased drama-" Jinsoku dove to the side, narrowly missing a blow that cut the tree down. No time for thoughts, only reaction. Rolling to his feet, he saw another blur heading straight for him. A jump to a nearby tree limb 9 feet up enabled him to evade once more. "What are you doing, boy," the voice this time was up close and personal. It sounded similar to hundreds of knives being sharpened at the same time. Its limb, a tendril, cracked and wriggled, whipping around as it spoke. "Is this your first time fighting a Hollow? Are you even Shinigami? If so, show me your Zanpakatou. I'll lash you to shreds before I feast on your just ripe spirit." "Do you enjoy toying with your victims before you consume them?" Jinsoku simply stated. "I've been holding back as well. As for a Zanpakatou, I don't own, nor need one..." Jinsoku released his spirit power. The pressure caused the Hollow he was standing before shudder. The shudder became convulsing. Next was laughter, a screeching and incessant ear pierce. "You're better than I expected! Now it is time for me to dine..." A great wave flowed through the air, showing the pure force this Hollow held. At that same moment, lightning tore the sky once more, showing the wickedly dark mask of the Hollow, smile agape. Its body appeared scaly, like a reptile's. 4 tendrils squirmed around its legless body, which was mottled with spots. Within that same moment, Jinsoku froze. "No way... a Hollow is this strong?" His thoughts wandered. "I've been underestimating him this whole time. He could've killed me earlier..." Jinsoku's hand tightened into a fist. As a tendril elongated and sped towards him, he hopped to another tree, then jumped down. Speeding towards the Hollow, he couldn't concentrate on tactics. 2 more tendrils leapt at him from both sides, while another plunged straight towards him. Jinsoku sprung into the air, simultaneously kicking the two tendrils away. Using the momentum of impact from the kicks, he dove forwards the Hollow's mask. "Bring all my force into this one punch..." Jinsoku thought. Inches away from landing a square hit, the Hollow grasped Jinsoku's leg. Squeezing his leg to pulp, Jinsoku did not cry in pain, but merely winced, hanging upside down. "Oh?" The Hollow brought Jinsoku's face to his. "Do you not feel pain?" The stench of decay loomed heavily upon the Hollow's breath. The grip tightened, as Jinsoku's leg seared in agony; it felt as if it was going to explode. The pain was so excruciating, but he could not falter. Jinsoku bit his lip. "I won't die, not yet," he screamed in his mind. The Hollow seemed to be deriving pleasure from this; it laughed once more. "While it's distracted..."
"I will live!" Everything Jinsoku had, his strength, emotions, spirit pressure, pain, he drove through his fist. Time stood still for that brief moment. The wind's howling stopped, the Hollow itself paused. Jinsoku held his breath, and the Hollow lessened its grip on his leg. His knuckles remained connected to the Hollow's mask. Jinsoku slowly pulled his fist away. A fracture, no bigger than the size of one knuckle, was all that he had done. The Hollow let go, as Jinsoku dropped, he turned his body so that he landed on his feet. Jinsoku staggered, his one leg refusing to move. "Nothing, all that I can do is nothing..." Jinsoku repeated constantly. Stupefied, he stood before the Hollow. "Had he not crushed my leg, I could have escaped. But why run? I don't deserve to live. It's a shame, to not be able to fight anymore, to live." A tendril immediately pierced through Jinsoku's arm. Around the size of a fist, only the tip had gone through. "No one has ever done that to me before!" Screeching, the Hollow used the broad side of another tendril to smack Jinsoku's face. THWACK! With the other two tendrils, they grasped Jinsoku's arms firmly. "I'll rip off your arms, and kill you with them!" His arms being pulled from their sockets, Jinsoku dared not cry out in pain. "SCREAM!" The Hollow yelled. "Let me hear your pain!" Sadistically laughing, it continued to hammer Jinsoku's body with the other two tendrils. The pain was excruciating. His eyes growing heavier, Jinsoku struggled for consciousness. Blackness threatened to consume him. "Everything about you... disgusts me," Jinsoku calmly said. The Hollow stopped its tug, and relentless hitting. "I have respect for your strength... but the fact that something as horrid as you can claim that power sickens me even more." With that said, he spit on the Hollow's mask. Without any strength to carry on, Jinsoku faded to nothing. Jinsoku opened his eyes, as a blinding light forced him to close them once more. Groggily, he forced himself up from a lying position. Something wet started running on his cheek, moving up and down. "WTF?" Jinsoku quickly shot backwards, opening his eyes. "A dog? Where the hell am I?" 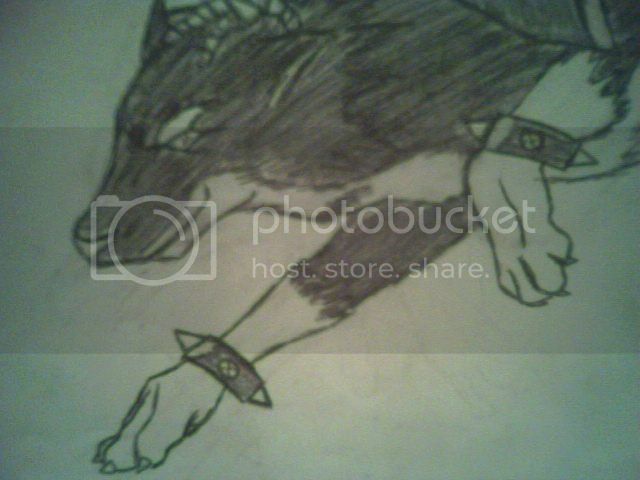 A cross between a doberman and a wolf panted happily before him. He was lying in a hut, and not in the forest. "Wait, you were the one..."
"That got attacked by the Hollow." Mamoru, an elderly man, hobbled towards Jinsoku, smiling. Jinsoku raised his arm to scratch his head, but stopped from the pain. He looked, and both his arms were put in casts, along with his left leg. "You were there the old time, Old Man?" "Correct. You had better not move too much, seeing as that Hollow broke your arms and leg, as well as creating such a deep wound in your left arm." Mamoru stroked his long moustache, once again smiling. "Why did you save me," Jinsoku screamed out of rage. "Even with your training, I'm not worth it. I've failed you, Sensei!" "Quite the contrary, my bright pupil," Mamoru always spoke with a firm, yet gentle at the same time, tone of voice. "You've exceeded my expectations. I didn't think that you would even manage to touch that Hollow. You managed to fracture its mask with your fist alone! That's quite impressive!" Jinsoku looked away, muttering under his breath, "It still wasn't enough. I'm weak." Mamoru put his hand on Jinsoku's shoulder. "Not at all. This means that you are more than ready." "Ready... for what," Jinsoku hesitantly said. "For the Academy, of course. I'll recommend you, and you can go as soon as you've healed." The dog barked joyfully in response. "And of this dog? Why is it still here," Jinsoku inquired. "The dog," Mamoru said while petting it, "actually fought beside me when I saved you. When I brought you here, she wouldn't leave your side. I believe she's a stray." "You," Jinsoku looked at the dog's eyes, which held reverence. "Have you no path of your own?" The dog barked back in response, then lowered its head and whimpered. "I will give you a path, just as you have given mine, this day I decided to save you. I shall name you Michi." The dog licked his face, and barked again. Mamoru laughed. "I don't believe they'll let dogs into the Academy." "No matter. Michi will stay by my side until the end," Jinsoku said. Volume 12, When Will It End? Volume 20, What's In a Name? Persona: Emotional, loud, and usually very nice. She isn't afraid to speak her mind, and doesn't care what anyone else thinks about her. With a normally welcoming and warm personality, she causes others to be a little nicer, just by being around her. She sympathizes with strangers immediately. Can be a flirt, intentional or not. Cross does have her tendencies. If she feels wrongly justified, she'll speak out and argue. Although she doesn't like to fight, she feels it in her heart to stand up for herself and protect others, and fight if it's the only option. She hates being lonely; this was her first reason to befriend Jinsoku in the first place, and is her compelling drive to be a Shinigami, even though she loathes violence. Physical Stature: 5'7, 112 lbs. Thin, with a toned body (Cross knows how to take care of herself). Slightly tanned complexion. Recently, she's been wearing her red hair with purple streaks in random pigtails all over her heart-shaped head. Has a cross tattoo over her right eye, and bears a barbell piercing in her left eyebrow. Another barbell is horizontal across the bridge of her nose. Wears a beaded cross earring on her left ear. Sometimes, she'll stick out her tongue either jokingly or mockingly, and show two barbells on her tongue. The irises of Cross's eyes are an odd mix of blue, green, and purple, somewhat like a mini-rainbow is located in her eyes. She wears a traditional Shinigami uniform, but ripped off one of the sleeves, exposing her right arm, wearing various buckles and charms, and covers her forearm with a baggy cloth. Her right pointer finger has a strange metal claw covering it. She likes to show off the small cleavage she has, and also her left leg when wearing a gi. Biography: Cross hasn't yet trusted anyone enough to tell about her mysterious past, when she was still alive. She smiles happily, telling others to think about the present, and not the past. When she was in Soul Society, she meandered about, looking for a place to belong, but couldn't. She lived several lives there, performing random odd tasks. Despite her warm nature, she couldn't find any true friends, only acquaintances, and for a while, was content with being a vagrant. For some reason, she liked the outer districts of Rukongai. Fed up of seeing suffering, so many Hollows, and others being lonely, Cross joined the Academy. The person that stood out to her was Jinsoku. They had both injured their sparring partners, and were assigned to each other. Regardless of their differences, they eventually became friends. Michi, Jinsoku's dog, had become friendly with Cross immediately, a trait that surprised Jinsoku. Cross and Jinsoku were thieves on the campus, but returned the valuables back to their owners. A student named Tian-Cai caught them, and they reluctantly became friends with him. After Cross warmed up to him, they became like a small family. She graduated a year early with Tian-Cai and Jinsoku. Commander of the 1st Division Shinkou Masaru assigned Cross and Jinsoku to the 5th Division of the Gotei 13. The red and purple haired woman then was transferred to the Onmitsu Kidou, once Jinsoku became a Vice Captain. Persona: A young man and genius, Tian Cai sometimes holds a rather uptight air. He's confident in his abilities, thus having an attitude like that. Unlike most youth, he abandoned all childish actions. A more straightforward type, Tian Cai is rather blunt, and serious, and acts nothing like his age. With the exceptions of pranks, and his obscenely gross sense of humor. But in public, he maintains an air of withdrawn, almost aloof, coldness. Physical Stature: Tian Cai is still growing, but currently, he stands at 5'5, 130 lbs. His physique in itself is hardly known, since Tian Cai is the type to wear heavy baggy robes, so his skin is rather pale. He also likes to wear hoods all the time, so it covers his hair, which is long and black... or at least the bangs are. Zanpakutou: A Zanpakutou that is hidden deep within his robes, and hasn't been revealed yet. Biography: Tian Cai doesn't feel like explaining his death. Like Cross, he prefers to look at the now and not the past. He died around the age of 12, where he was founded and adopted luckily by a rather popular family in West Rukongai, 1st District. The boy had an incredible talent with Kidou, even when he was alive. Without knowing it, he had tapped into Kidou several times as a youth. Showing his skills in Soul Society, he was suggested to go into the Shinigami Academy. Once there, he was amongst older people, decades older, even centuries older. Tian Cai kept his cold attitude, preferring to be hooded, and never let anyone get a good hold of his face. What he didn't expect was Cross and Jinsoku, as they forced themselves into his life and befriended the "loner." Once all three had graduated from the Shinigami Academy, Jin and Cross were moved to 5th Division, whereas Tian Cai's skills in Kidou granted him a spot in the Keigun. A group of rogue Shinigami, their true intent is unknown. Their numbers are undetermined, but these six were present in their first encounter. Persona: Cold, calculating, sinister. All the qualities an anti-hero should have. Lucien has a certain appreciation, a desire, for blood and fighting. However, he isn't just a savage. Lucien likes to fight his opponents mentally as well. More about him later. Physical Stature: 6'1, 193 lbs. Lucien has unruly hair that comes down to his nose, and it covers his left eye. His right eye is a glimmering purple. Two strands of green stand out amongst his black hair. His lower lip, on the left side, has a hoop ring. He likes to wear black suits with the sleeves rolled up. Spoiler: Lucien and Kariudo during the War. Zanpakutou: A standard Katana-style Zanpakutou. Name not yet revealed. Zanpakutou Shikai: Wouldn't you like to know?!? Division: Ex-Vice-Captain of the 5th Division. Biography: Look above. He was around during the Great Hollow Wars, and was known as the "Walking War Child" . He hangs out with his group of Rogue Shinigami in the Living World. They kill Hollows... and stuff. Persona: Kariudo is a quieter, reserved type, as compared to Lucien. He shows very little emotion, and seems to be in constant thought, almost aloof to everything. That is what he shows outside of battle. In battle, he becomes a monster. However, it seems like he has a disdain for fighting in general. The truth shall become known in the future. Physical Stature: 6', 189 lbs. 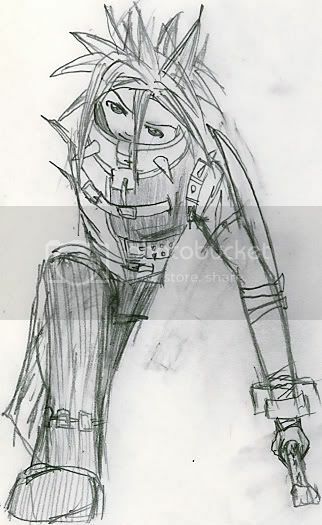 Kariudo has long, silver spikes in the front of his head, with shorter black spikes in the back. An x-shaped scar lies across his face; one scar straight horizontally across his nose, the other running diagonally across his face, running from the lower cheek, over his right eye, and stopping in the tip of his forehead. He also bears a ball piercing in his lower lip, directly in the center. His eyes are a dark misty grey. On his back, he sports a large kanji tattoo of the sign "Peace." His attire is a short vest that comes down to his stomach, and some kind of chest armor underneath. He's a victim of the baggy, tore up pants. Zanpakutou: A rarely used standard Katana-style sword. Name will be revealed in time. Zanpakutou Shikai: An enormous Zanbatou-like sword. Full description will come. Division: Ex-Vice-Captain of the 3rd Divison. Biography: Look above. He was around during the Great Hollow Wars, and was known as the "Silver Slayer" . He hangs out with his group of Rogue Shinigami in the Living World. They kill Hollows... and stuff. Persona: Brutus has an insatiable thirst for blood and violence, rivaling, or even beating Lucien in that prospect. He's a sociopath serial killer, that's all there is to it. Physical Stature: 6'7, 262 lbs. Brutus's face has a longer-than-average nose with a crop of long wild red hair, and a beard. His small eyes hold red, crescent shaped irises. He looks more like a monster than a human. Bakimono! His style is the sleeveless hoody and baggy cargo pants. Don't have a drawing right now. Zanpakutou: A long, nodachi-type blade. Name??? Zanpakutou Shikai: Does he have it? Biography: Once a respectful Shinigami, he later went mental. Bent on a murderous rampage, the AWOL Brutus went on his own, calling no man his Captain... until he was caught. Supposedly, according to records, it was said that he was executed. He hangs out with this group of Rogue Shinigami in the Living World. They kill Hollows... and stuff. Persona: Saikobi is a vain girl. She takes pride in her appearance. She's a joker of sorts, the goofball that somewhat annoys people. She's very spunky. Physical Stature: 5'5, 107 lbs. Thin, hotness body- she's not named Saikobi (most beautiful) for nothing. She has three yellow/blonde bangs that run off the side diagonally on her face, while the rest of her chin-length hair is blue. Her bright blue eyes shine like stars. Her choice of clothing is black stuff with revealing fishnets. Zanpakutou: Simple katana-like weapon. Hilt appears to be like an eye. The name is Medusa. Zanpakutou Shikai: Medusa changes into a whip like blade, very flexible, but still retaining the design of a sword. Its edges are extremely sharp because they are so thin. Medusa's ability is able to turn whatever it connects with into stone. Zanpakutou Bankai: I'm waiting for it... Who can wait? Division: She ditched just before graduation. The pressure! Biography: Remains to be heard. She hangs out with this group of Rogue Shinigami in the Living World. They kill Hollows... and stuff. Persona: Cocky, overzealous. Pompous, yet insanely intelligent. Loves to battle. Physical Stature: 5'11, 175 lbs. Has short cropped, black hair, with a streak of grey on his right side. Has green eyes, but he normally covers them up with sunglasses. Likes to wear pinstripe suits and overcoats. Zanpakutou and Division: N/A... He's a Quincy! Biography: A fallen genius among Quincy. He hangs out with this group of Rogue Shinigami in the Living World. They kill Hollows... and stuff. Persona: Obedient to Lucien. She is the stern, quiet, no-nonsense type. Physical Stature: 5'6, ??? lbs. She wears a veil and cloak. Her hair is dark. Why would I draw a picture of someone with a veil and cloak?!? Zanpakutou: Dual, halfway length between kodachi and katanas. Covered in sheathes on her arms. Name of Zanpakutou = ???? Zanpakutou Shikai: The dual blades of hers change shape slightly; the actual cutting sides of the blades themselves contort into different shapes, to form a fire-like appearance. Its ability is rumored to grant Genesis God-like speeds. Biography: ???????? She hangs out with this group of Rogue Shinigami in the Living World. They kill Hollows... and stuff. Persona: Rude, sadistic, cruel, with a tinge of insanity. Not so bad as Ryo. It seems like the Alpha and the Omega enjoy recruiting people like this. She somewhat flirts with Safumi. Physical Stature: As quoted by Ichigawa (TheLoser aka Pandie) - "She had long dark blue hair, with glinting brown eyes and an attractive figure." She wraps bandages around her calloused hands, meaning she's a hand to hand fighter, just like Jinsoku. Zanpakutou: Tucked at her side is a very small dagger. The name is unknown. Zanpakutou Shi Kai: She bypassed the Shi Kai command phrase during her encounter with Jinsoku, so this means she has attained Ban Kai. The dagger at her side changes into two foot long claws connected to metal bracers surrounding her entire forearms, extending from her knuckles. The ability she's shown is able to change the individual claws into living, breathing, wolf heads, which increase her distance in close range combat. Little else is known. Zanpakutou Ban Kai: She has it. Just hasn't shown it. Division: Her information about that is closely guarded by herself. Only Lucien and Kariudo know what seat and Division she used to belong in. Biography: Unknown. A Shinigami who left the Gotei for this rouge group. Persona: A rather egotistical man, sadistic, cruel. Proud of his abilities. Hot tempered and angry. A lot. Pretty crazy too. Physical Stature: As quoted by Ichigawa (TheLoser aka Pandie) - "His eyes were like chips of ice, and his hair was an unruly mess of silver. Rail thin." "Looks of insanity" also grace his face often. Zanpakutou: Mariko. A longer than average Katana, which he normally likes to wield without the sheath. Sheath is strapped to his back. Zanpakutou Shi Kai: "Scream, Mariko." Mariko changes into dual chainsaws, their motors whirring and buzzing incessantly. Black smoke emenates from them every once in a while. Mariko's one ability is to let the teeth of the chainsaws split off and become mentally guided by Ryo, much like Byaykuya's Senbonzakura. Division: Unknown, before he left to the Alpha and the Omega. Biography: He pretty much left the Gotei to join these rogues. Was killed by the then Vice Captain of the 11th Division, Junichi Terada. Age: It's a trip when his age is revealed. Persona: Enjuku is the type that gets by without really being noticed. He is a rather quiet person by nature; he is very reserved, calm, and stoic. Although he can be a conversationalist if necessary, he'd prefer to keep things short, simple, and sweet in dialogue. Which is why he only speaks when spoken to, but has a mindful of thoughts swimming through his head. In terms of how he views others, Enjuku respects authority to the utmost extent and loyalty, while others below him he finds to be just ordinary people, like himself. Not one to judge, he however is very self conscious and this is why he avoids contact with others most of the time. He is a very hard worker and never gives anything less than his all. Prompt and punctual, he plans ahead of most things and tries to view everything in an analytical way while solving ideas abstractly and methodically. Though he hardly uses facial expressions and displays emotion, that isn't to say he is of lack of any to begin with. It only seems this way due to his inverted nature. Enjuku feels strongly about countless things- and given the chance, he doesn't hesitate to voice his opinion. However, on the same token, he detests confrontation and fighting, which is part of the reason why he hardly speaks to begin with. Only when morality is taken into consideration does he ever truly become vocal. Favorite Food: Nothing overly sweet or bitter, but has a love for spicy food. Likes: Simplicity and Quiet, Classical music, Learning, Green Tea, Nature, Kidou and Zanjutsu (the arts and discipline, so as not to be confused with his dislikes). One of the first things to notice in Enjuku's appearance is his laid back, half closed, eyes. They appear to be apathetic in regards to most things, and accompanied by the fact that he hardly says anything, only makes it seem even more so. But these eyes are various shades of gray, reminiscent of the ocean- at times they'll contain multiple flecks of shimmering jade and icy blue, shifting ever so steadily like the tide. There are moments, though rare, when the stoic's eyes have said to turn crimson. These portals are hidden behind half rimmed glasses, which are only rimmed at the top half. These glasses aren't for decoration; the man is nearsighted. A rather skinny appearing person, his robes underlie a somewhat well toned musculature underneath. Not extremely muscular, not completely defined, but the man does have muscles, despite his almost pacifistic nature. His hard work does show through that way. An olive and bronze composite of skin tone displays a rather dark enough tan, considerably darker than most normal Shinigami/Souls, but nothing extremely dark (think Yoruichi). His hair is dappled with the absolute middle of silver and white hair, a steely yet bright gray. Though randomly crossing these locks are pure white streaks running cleanly amidst it. For some reason, even when tied back, creates a spiky mess that scatters haphazardly. It somewhat goes against his normally clean and simple nature, and he really doesn't like it all unkempt, but there's nothing he can really do about it. Sadly, he finds his hair to appear like a pineapple head. Zanpakutou Shi Kai: Haven't decided on one yet. Persona: Careless. That in one word sums up Dante as a whole; the man doesn't find many things interesting and would personally just live a life unfettered. Unfortunately, one cannot simply continue on this way of living when given such a prominent stature and role. Indifferent to almost everything regardless, he still has one of the most forgetful minds. It seems to go hand in hand with his nonchalance towards things. Favorite Food: ??? He might forget to eat for long periods of time. Likes: Nothing in particular stands out to him. Dislikes: Doesn't seem fazed by many things. Dante is a gaunt man, rather lean and scruffy. Despite his indifference to strength or anything of the like, his body is surprisingly well toned and defined in terms of musculature. His skin is tan, a deep bronze due to his heritage of Spanish and Filipino. Medium length hair settles in unruly spikes adorning his crown; in the front and bangs his tresses are silver, whereas the back is pure jet-black. Sky blue eyes reflect the atmosphere he constantly finds himself gazing at. Despite his nonchalance in physical appearance, he seems to favor a modified version of a school uniform, adorned with multiple pads and the like. Zanpakutou: Sekai ("World" ). Sekai is a shikomizue, or a cane sword. The handle and scabbard give the appearance of pure wood, or a simple cane or staff. There is no handguard due to the craftwork of the blade. Sekai's being, or manifestation is known as being as careless as Dante. Biography: A Vizard in the Army of Masks. Born half and half of Spanish and Filipino. Not much else is known about him. Persona: Just like his name suggests, Genki is energetic, lively, full of vibrance. Hotheaded. Very enthusiastic to fulfill his duties, a straightforward youth with aspirations to grow. Rather simple minded in this case- but equally focused. Simple mindedness does not equate to idiocy though, such as the genius's case. A brash and impetuous individual who only sets his sights on his goals. Easily influenced by his emotions. Genki is a well built teenager, bristling with the fire of youth. He has a great pride in taking care of his body, and as such, it is mirrored. He has steel grey eyes which brim with his enthusiasm to succeed. His skin is of a fair tone, though no one knows what he truly looks like due to his Keigun garb of ninja-like robes. Zanpakutou: Daikiri ("Diamond Cutter" ). Genki pushed himself to his limits to attain Shi Kai at such an early age; though he doesn't know much about it. Biography: The son of one of the Keigun's great squad leaders, Genki was raised to be the best. He is no exception. Partnered up with his social antithesis, Tian Cai, the newly recruited officer now wants to prove himself. Age: Ranges in about the late 40 to 50's. Persona: His persona is completely laid back so long as he has a beer in hand. Cross him or get on his bad side and he'll have you "Kissing the Rings". A slight pervert, he greets women by hugging and groping them. On the other hand, he smacks guys in the back of the head with his slippers. He usually gives the excuse of smacking other guys by blaming it on an annoying fly (but there really isn't a fly there). When Uncle Tito Bobby has too much drinky drinky, his wife appears from the deepest shadows, mauling him like a bear- leaving him wasted and mangled on the floor. Hobby: Drinking, Smoking, Harassing the youth, Asking people to "Kiss the Rings". Personal Treasure: His beer bottle pyramids made from San Miguel bottles. Uncle Tito is Filipino. As such, he has the usual phsyical characteristics. Pepper black/white/gray straight hair (actually he is losing a lot of hair on his head, but in turn has them grow on his back). Large, dark brown pupils. A very well tanned complexion. He lounges around the Gotei wearing a wife beater, tropical designed shorts, and slippers. Around his neck dangles a gold chain with a cross fitting of a gangster rapper. On each of his hand there are his fabled rings, with huge baller-ish rocks on them. Zanpakutou: He holds no Zanpakutou, but his other weapons are usually the belt which he is able to summon on command. When disarmed he will resort to the chinellas (slippers), but when all else fails he will unleash a massive blow with his hands known as "Kissing the Rings". Some say it surpasses the "Demon Fist", or even "Fist of Destruction" in overall power. the scene was taken from a portion of this volume by Lazy: Opening the Gates to Hell (con'd) (in chap. 8) n_n; tis two of his NPCs Saikobi and Korymbos.